On the creek,, moving some material! Ray Kobler here. 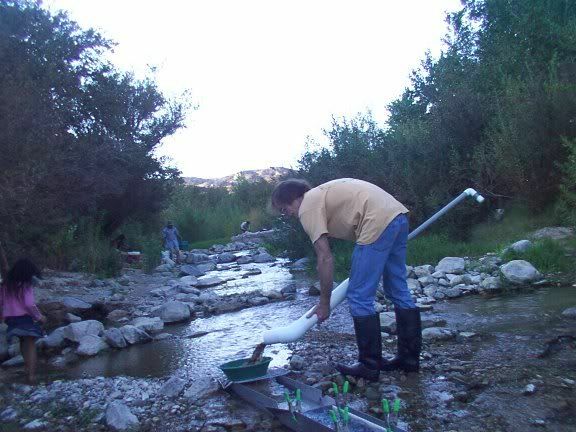 Started gold prospecting in 1968, and have been doing it ever since then. Retired as a consruction electrician in 1998. Now I build hand dredges. I have built and sold over 1600 so far, since Feb. 2003. I am an active member in a couple of our local prospecting clubs, the Hi Desert Gold Diggers, and the AU Mojave Prospectors. (In Southern California).I am a lifetime GPAA member. I was vice-president for several years for the Hi Desert Gold Diggers, and currently I am the treasurer. Cannot find if you do not look! Welcome to the forum Ray lots of good people on this site.